In the mid-1970s, Walt Disney World was working to come out of the slumps that paralyzed the travel industry. Various Phase II hotels were scrapped and new ideas were brought to the table. In line with Walt’s vision for EPCOT Center, WDW management developed the Lake Buena Vista Resort Community that consisted of a large hotel/resort area, a shopping village and a business center. The Disney Village (now part of the Disney Springs complex) opened on March 22, 1975. 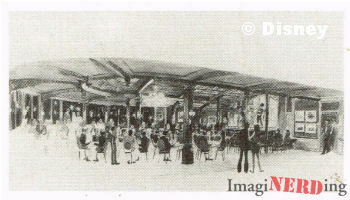 It was an eclectic mix of shops and eateries that placidly raged against the trend of boxy and concrete shopping malls. 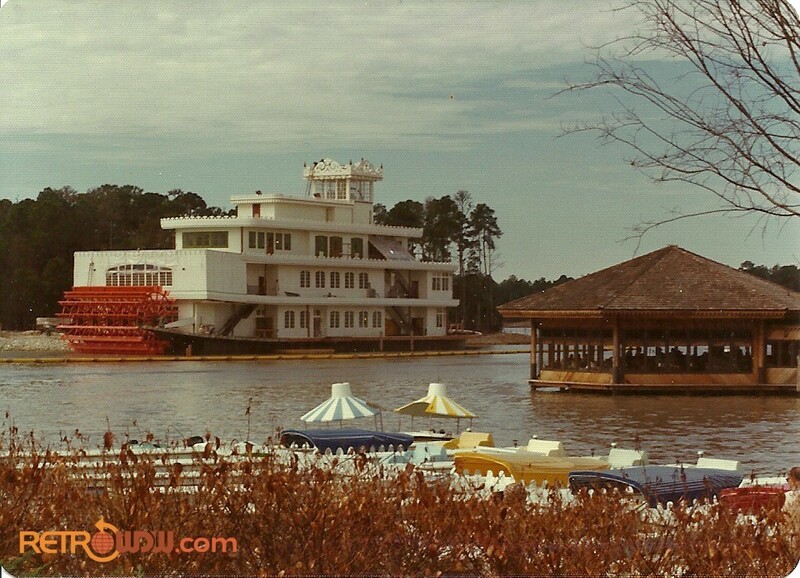 In November, 1975, one of the major Phase II developments of Lake Buena Vista was a yet unnamed riverboat-styled restaurant. Construction was to begin in April of 1976 and expected to take 18 months. The general description of the restaurant stayed fairly true to what was built. The following descriptions are from various Eyes & Ears cast publications in the 1970s. The exterior will be heavily decorated in mahogany and brass. The stem paddle will turn as an additional show factor for guests strolling on the decks and dining in the restaurants. At the bow of the main deck is a show bar. Decor will be turn-of-the-century, Bourbon Street- style with a mahogany bar, wood planked floors and stained glass. 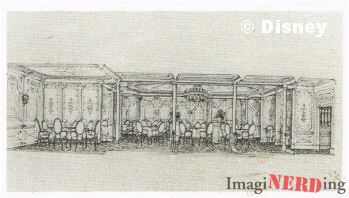 This concept artwork was captioned as the Empress Room, but would appear to actually be the Baton Rouge Lounge. At the stem of the main deck will be a steakhouse restaurant. 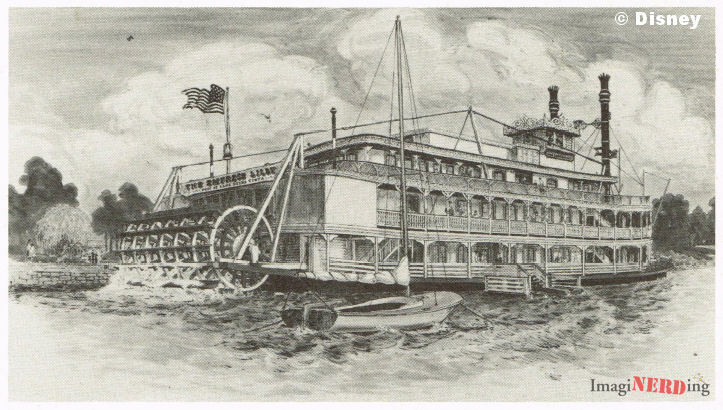 It will carry the same turn-of-the-century decor with a dominance of mahogany, burgundy colors and leaded glass…and offer the guests a view of the paddlewheel and the lagoon. The second (or “promenade”) deck will feature a seafood restaurant at the bow and an elegant gourmet restaurant at the stern. Decorated in Louis XV motif, the gourmet restaurant will contain a raised dome ceiling with a large chandelier, etched glass panels between banquettes (booths), silk or damask wall coverings, sculpted wall moldings and details of off-white and gold. There will also be an exclusive entry to this dining room from the dock via a gangplank. Although captioned as the Baton Rouge Lounge in the article, it must be the Empress Room based on the description. On the third or “Texas” deck is a dining area suitable for banquets and private parties and a lounge. Other elements of the boat include two waiting lounges and the ‘quiet lounge’…an intimate cocktail area. 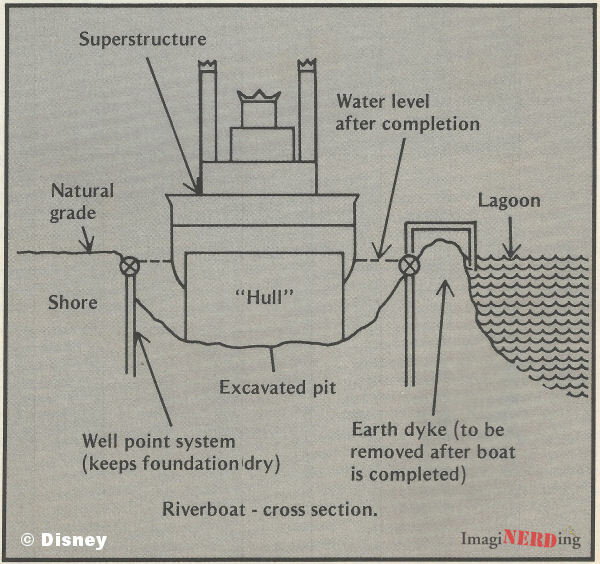 As the year went on, Disney occasionally updated the cast members on the construction of the riverboat. 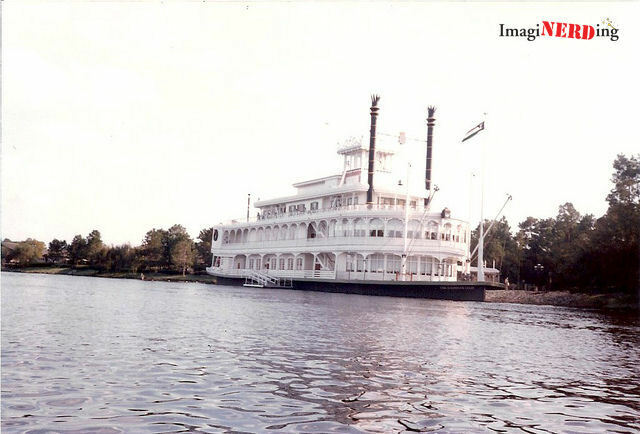 By May, 1976 the riverboat was officially named the Empress Lilly as construction began. The Edward Nezelek Company of Fort Lauderdale was named General Contractor for construction and the opening date was set for April 1977. Disney reminded cast members that although the Empress Lilly is a building on a concrete base made to look like a boat, down to every last detail, they should still be mindful not to ruin the illusion. So, if someone asks you about sailing times or cruise destinations, please don’t ruin the illusion by stating that the boat is concrete and cannot move from her foundation. 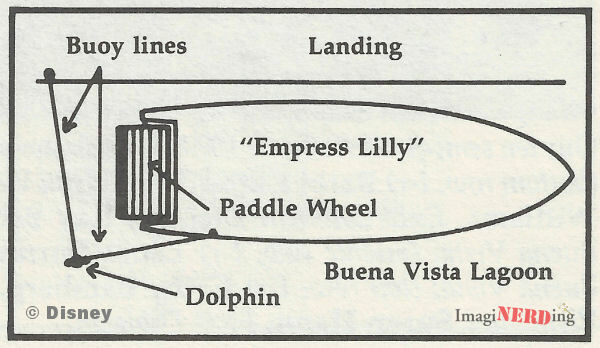 Tell the guest that the Empress Lilly is permanently moored at Lake Buena Vista and that the size and depth of the lagoon, waterways, etc., will not permit the boat to be sailed to the Magic Kingdom, Fort Wilderness, Buena Vista Club, etc. 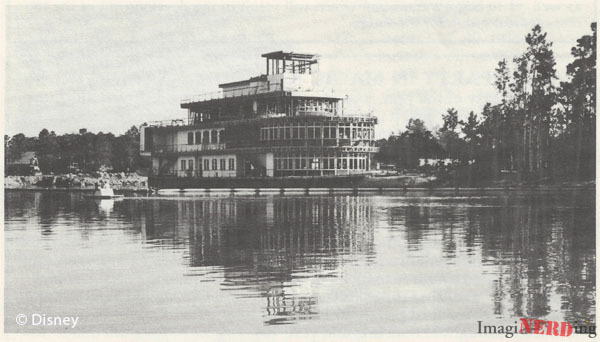 Disney also released a series of articles in Eyes and Ears that looked at the construction of the Empress Lilly. I am still a little surprised to run across these articles since Disney keeps everything so close to the vest these days. One thing that I never thought about when I was enjoying the various watercraft while plying the waters of the Lake Buena Vista Lagoon was running into the paddle wheel of the Empress Lilly. Apparently, Disney thought this might be a problem, so they used a dolphin to address the issue of guests getting too close to the wheel while trying to take photos while boating. I ran across a great image of the Empress Lily under construction at RetroDisneyWorld. Besides being able to see the construction wall with the yellow barrier/floats on top, there are two Bob-A-Round boats in the photo. Score! The restaurant finally opened on May 1, 1977. Walt Disney’s widow, Lillian Disney was on hand to christen the riverboat, which was, of course, named after her. But this is a story for another post. Looking for a great resource on Disney history? Jeff Kurtti’s 1996 release Since the World Began is still the only official history of the Vacation Kingdom of the World. Let’s hope they ask Jeff to write the second 25 years, as well. Did you ever get the chance to dine on the Empress Lilly? Do you have any great memories of the riverboat? I went there a few times growing up. My first date with my wife was at the Empress Lilly in 1992. We sat at the window by the paddle wheel. Always loved it, it was light inside with plenty of natural light coming the windows. I’m always glad we got the opportunity to dine there. I never got to eat there. I wish that I could have visited during the 80s.